This Growth Mindset Award will reward students for their hard work, dedication, and job "well done!” A mindset is a perception people hold about themselves. People can have a fixed mindset or a growth mindset. With a fixed mindset, people believe their basic qualities are fixed traits that cannot be improved upon. "I'm just not that smart” or "I'm just not a fast runner.” With a growth mindset, people believe that their basic qualities can be developed through dedication and hard work. "If I try hard, I can become smarter,” or faster or stronger, etc. A growth mindset fosters a love of learning and a resilience that sees failures as opportunities for growth. In addition, students with a growth mindset think more positively about themselves, maintain a can-do attitude, and possess the self-confidence to take on new challenges. 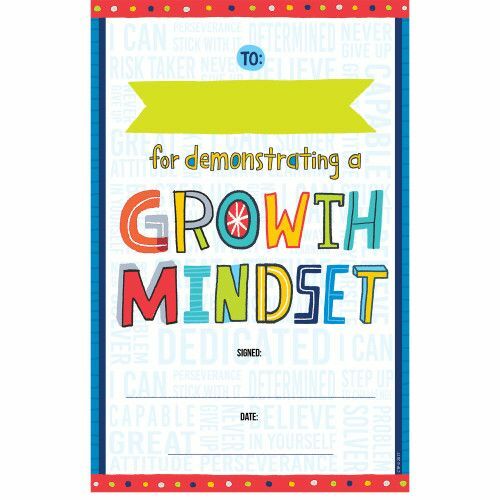 This award certificate features motivational words and positive phrases about having a growth mindset.